Tattoo Blog » Meet Bob Tyrrell! Tattoo Blog » Inspired » Meet Bob Tyrrell! Better late than never. That’s what tattoo artist Bob Tyrrell has to say about his late start in the world of tattoo, and I have to agree with him. Bob grew up wanting to be an artist, but as he reached his teens he discovered the guitar and heavy metal and for many years afterward, music was his true passion. Bob played in various heavy metal bands and worked in a factory for fifteen years before getting his first tattoo at age 29. This initial tattoo regenerated Tyrrell’s interest in being an artist. He began taking art lessons and drawing once again. His rediscovered interest in art soon led to the world of tattoo and an apprenticeship at Eternal Tattoos in Detroit, Michigan. It wasn’t until the age of 34 that Bob began tattooing professionally at Eternal Tattoos. These days he’s still in Detroit but now Bob can be found at his own tattoo studio, Night Gallery. I once read an interview with tattoo artist Mario Desa, where he said that he’ll do any style of tattoo except for portrait work. 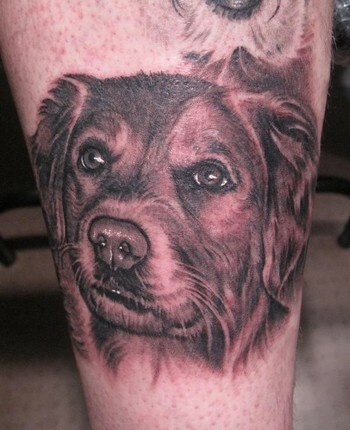 Desa maintained that if someone wants a portrait tattoo, they should go to a specialist. This is excellent advice. It takes a great skill and flourish to really capture the essence of a person’s face in a tattoo. When someone has it, their work speaks for itself. Well, Bob Tyrrell most certainly does have it. Nice one, Bob. Take a leisurely look through Bob Tyrrell’s online gallery if you’re interested in some phenomenally good portrait work. You know what? Even if you’re not interested in any sort of tattoo portrait work, you need to see his stuff. Because I think that if you see his stuff, you’ll start being interested in tattoo portrait work. Excellent stuff. There’s not much more that I can say about it. As I said before, when someone has it, their work speaks for itself.